Delicious chicken stroganoff sauce to be served over rice or egg noodles. 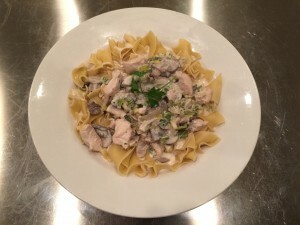 Here is the recipe, but be sure to follow along on the post with lots of photos here, Chicken Stroganoff. Thoroughly wash and slice the Leeks into thin rounds. 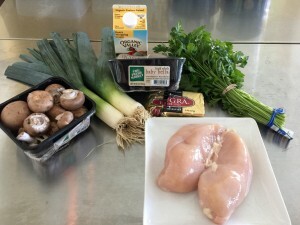 Trim and slice cross-grain Chicken into bite-sized pieces. Heat up the Butter and Olive Oil in a heavy frying pan. Sauté the leeks and add Vermouth and Water and simmer for 5 minutes until soft. Add Heavy Whipping Cream until covered. Simmer for about 10 minutes until Chicken cooked and tender.